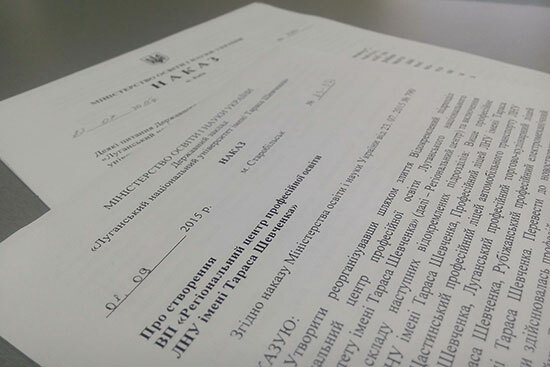 The first in Ukraine “Regional Center for Professional Education of Luhansk Taras Shevchenko National University” was created on September 1, 2015. The center was created according to the order of the Ministry of Education and Science of Ukraine No. 790 as of 23.07.2015 and SE LNU No. 83-3Д as of 01.09.2015. New subdivision was created by amalgamation of the following separate subdivisions: Higher Vocational School of LNU, Vocational School of LNU, Shchastia Vocational Lyceum of Automobile Transport of LNU, Luhansk Vocational Trade and Culinary Lyceum of LNU and Rubizhne Vocational Electromechanical Lyceum of LNU. The directions which were taught at the College of Technologies and Design of Luhansk Taras Shevchenko National University are added to the center as well. Acting Director of the Centre is Mykola Semenovych Kurylo. The combining was aimed to optimize work of subdivisions and to reform the vocational education which has not been changed since the times of Soviet Unions. “Reorganization will be carried out step by step so the students will not have difficulties in education”, — noted Mykola Semenovych.